According to Dr. Nathalie Issachar, PhD and Global Director of Research and Development at Clarins, "Approximately 75% of visible signs of skin aging are caused by harsh environmental factors, like sun and pollution. Only 25% are genetic." So if you’re worried about aging skin, you might consider moving to the moon. Without solar exposure, gravity and pollution, your skin would likely stay radiant and firm for much longer. We’ll let you know when your lunar condo is ready. Until then, there are things you can do closer to home—like protecting your skin from wrinkles by using the right skin care routine and the best moisturizer for aging skin. The following tips can actually help to slow down visible signs of skin aging. "Beauty sleep.” We know we need it, but why? For starters, sleeping in certain positions can cause sleep lines—wrinkles that become temporarily etched into the surface of the skin and contribute to the appearance of aging skin." Sleeping on your side can cause wrinkles on cheeks and chin. Sleeping face down can furrow your brow. So if you want to avoid wrinkles, and the look of aging skin, the best thing to do is sleep on your back. What we put into our bodies may come back to haunt us later in the form of aging skin. Fruits and vegetables contain high amounts of antioxidants that can help put the brakes on the mechanisms that lead to aging skin. Animal proteins and carbs, on the other hand, have the opposite effect. Dr. Issachar explains that it takes your body more energy to digest meats and sugars, which can trigger inflammation at the cellular level and accelerate the look of aging skin. Sun damage can happen before you know it—especially between the hours of 11 a.m. and 3 p.m.—leading to premature lines, wrinkles and sometimes skin cancer. Clarins’ moisturizers with SPF helps shield skin from the damaging effects of UV rays. 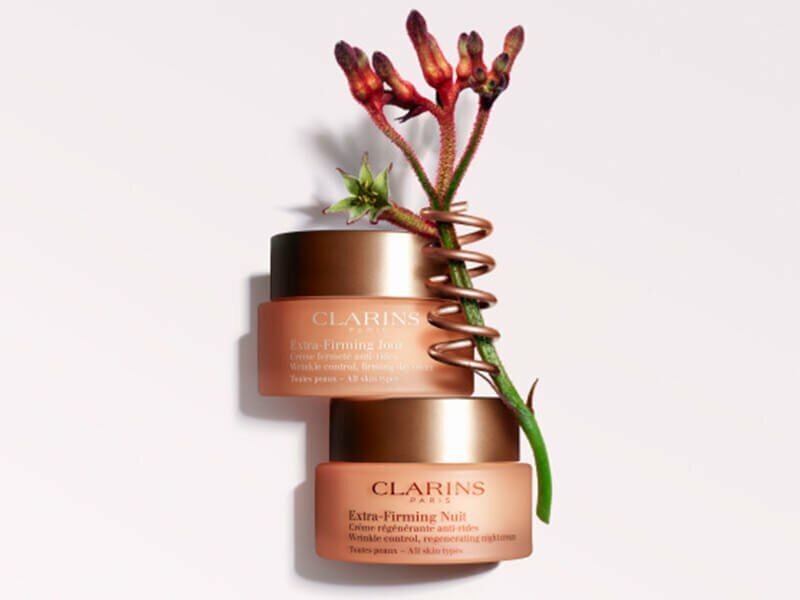 The best anti aging skin care out there: Clarins’ Hydra-Essentiel, Multi-Active, Extra-Firming and Super Restorative moisturizers all have versions with SPF built right into their formulas—to help you face the day defended. Find your best anti aging skin care routine. Using a moisturizer for aging skin, along with a proper skin care routine, can help prevent and visibly reduce lines and wrinkles. If you’re in your 40s, Clarins' Extra-Firming Collection is the choice for visibly firming, lifting and fighting wrinkles. For women 50 and up, rely on our Super Restorative Collection to replenish, illuminate and densify. Clean skin is key to a healthy-looking complexion. To help minimize the look of aging skin, remove your make-up before bed to free pores of trapped make-up, impurities, excess oil, pollution and skin-dulling dead cells. But don't overdo it. Washing too much strips the skin of wrinkle-fighting natural moisture and oils.